“While in Britain we applaud the courage of people in poorer nations and celebrate their successes, while we send money abroad to conserve large wild animals and, rightly, become upset if people start killing them, we seem determined not to participate. Protecting species towards the top of the food chain, with all the difficulties that can involve, is something other people should do: we would rather stand back and watch”, written by british editor George Monbiot. I returned from the meetings filled with amazement, and the stirrings of a hope, which has been all too rare in recent years. First, at the launch of Rewilding Europe’s Wildlife Comeback report three weeks ago, I heard about the remarkably rapid spread of large wild animals back into places, which lost them long ago. Then, at the World Wilderness Congress ten days ago, I heard how people and nations with very few resources, under almost impossible circumstances, were protecting or reintroducing “difficult” wild animals, species which are most controversial and which require the largest habitats. Amid the hope and wonder, what hit me hardest was this: while in Britain we applaud the courage of people in poorer nations and celebrate their successes, while we send money abroad to conserve large wild animals and, rightly, become upset if people start killing them, we seem determined not to participate. Protecting species towards the top of the food chain, with all the difficulties that can involve, is something other people should do: we would rather stand back and watch. I have been trying to understand why we are so far behind the rest of the world, why we fetishise deforested and almost empty ecosystems, why the United Kingdom, in the words of the biologist David Hetherington, is “the largest country in Europe and almost the whole world” which no longer possesses any of its big (or even medium-sized) carnivores, and why, above all, our conservation groups seem so unconcerned about the depletion of nature in Britain and so disinclined to address it. Let me first summarise what I heard at those meetings and have subsequently read. Rewilding Europe points out that its findings do not invalidate concerns about the global loss of biodiversity. This is happening at rates unparalleled since the previous mass extinctions, caused by meteorite strikes or gigantic volcanic eruptions, and it is being driven by human action: the trashing and clearing of habitats, pollution, acidification, global warming and the direct killing of vulnerable species. Europe is not immune to these extinctions, and some species, both on land and particularly at sea, are being pushed to the brink with astonishing speed. But at the same time something remarkable and unexpected has been happening. In many parts there has been a great restoration of habitats: partly accidental, as farmers have vacated marginal lands; partly deliberate, as ambitious European conservation groups have secured the protection of large areas. There has also been a sharp reduction in the persecution of many species, which people previously either hunted for sport and food or sought to exterminate as vermin. Animals, which were once hated, are now protected and cherished. Even the species, which seemed least likely to return – those, which require large territories and were reviled by people – have started to bounce back. For example, by the First World War, the wolf’s range in Europe had contracted to just 7% of what it had been at the time of the French Revolution. It was extinct almost everywhere. Well into the second half of the last century it was still persecuted in its last redoubts. But since 1970 its population in Europe has quadrupled: there are now around 12,000 wolves on the continent. Relict populations in Eastern Europe, Italy and Spain have expanded into much of Germany, the French Alps and as far as central France, Catalonia in Spain, Denmark, Belgium and even, on two occasions, the Netherlands. While its populations are not everywhere secure, it is now as likely to be welcomed as feared, as a new generation of nature lovers delights in its reappearance, and as wolf-watching businesses have sprung up, generating income and employment in places where both were in short supply. A similar story can be told about the lynx, the golden jackals, the European Bison or the Elk. But missing from most of this story is the United Kingdom. Many of the species I’ve mentioned once lived here. 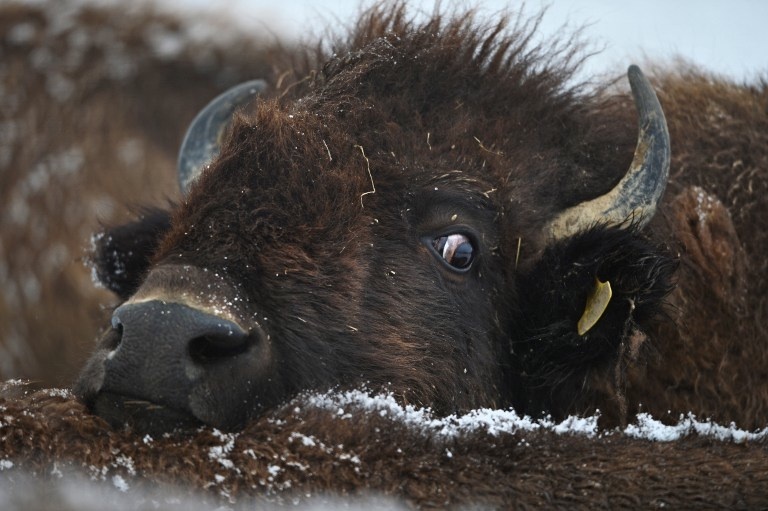 Bison in Britain died out during the peak of glaciation, between 25,000 and 15,000 years ago. They might have been prevented from returning at the end of the ice age (when this landmass was still attached to the Continent) by human hunting pressure. Wolverine survived here until about 8,000 years ago. Elk were exterminated later: the last remains found in Britain are 3,900 years old. Only three of the mammal species listed in the Rewilding Europe report are thriving in Britain: the grey seal, the roe deer and the red deer. When you think of the fuss we make about the 500 or so wild boar living in Britain, then discover that there are now 600,000 in Spain and 600,000 in Italy, a million in France and a million in Germany, you can, I hope, understand why I see Britain as the most zoophobic nation in Europe. World Wilderness Congress: why does Britain lag so far behind the rest of the world? At the World Wilderness Congress, I heard the brave and remarkable Li Quan explain her project to reintroduce the tiger into south China. The obstacles – political, financial, ecological, humanitarian – she has had to overcome are mind-boggling. But, having established and begun to rewild a viable captive population, and having sold the idea to local people, her project is almost ready to release the first animals. Think of this, when you hear farmers and fishery owners insist that we can’t afford to have beavers in Britain. So why does Britain lag so far behind the rest of the world? Why do our conservation groups appear to be so lacking in ambition and aspiration? Before I try to tackle this question, here are two observations. The first will be more or less familiar to people who follow this blog. c. which are the least favourable for farming. In Britain this means the uplands. This is why I have become obsessed with the way they are managed. But wildlife in the uplands, amazingly, is faring worse than it is in the crowded, intensively farmed lowlands. The State of Nature report, published in May, revealed that while 60% of wildlife species in Britain as a whole are in decline, in the uplands the rate is 65%. The primary reason is that almost all the trees and scrub – on which the majority of species depend – have been removed, mostly by sheep farming. On the Continent, the uplands are now largely forested, while the lowlands are largely bare. That is what you would expect. Upland soils tend to be much poorer than lowland soils, so farming is less productive there: generally many times less productive. But in Britain, while the lowlands are largely bare, the uplands are even barer. The places that should be our wildlife reservoirs are wildlife deserts. a. Stalking estates artificially boosting the population of deer. b. Grouse moor owners cutting and burning the land (and killing hen harriers and other predators) to maximise the population of the upland chickens people pay to shoot. c. Governments spending public money to sustain farming – almost entirely sheep grazing – in the hills. There would be no hill farming in Britain or anywhere in Europe were it not for subsidies. “I am absolutely clear that we have a real role to play in helping hill farmers to keep the hills looking as they do”. This, remember, is the government that refuses on principle to intervene in the market unless it is deemed unavoidable. Yet the environment secretary pledges to use public money to maintain a wasteland. 2. The policies you would expect conservation groups to prioritise would be those that optimised the protection of wildlife. Instead, they have more or less optimised its destruction. I cannot emphasise this strongly enough: the entire basis of upland conservation, as pursued on most of the upland reserves owned or managed by the Wildlife Trusts, the RSPB, the National Trust, Natural England, Natural Resources Wales, Scottish Natural Heritage and other bodies is based on a misconception: that in keeping them open and largely devoid of trees, they are best protecting wildlife. This belief, which is largely unexamined by the groups that propound it, is diametrically wrong. It explains why many upland reserves are about as biodiverse and ecologically inspiring as the average car park. Usually, when British conservation groups seek a justification for their war on three-dimensional habitats, they fall back on tradition: this is how the land was, so this is how it should remain. They ignore the fact that almost the whole of the British Isles, including the uplands, was densely forested, before it was cut and burnt and grazed by people and their animals. This is what gets to me most: not just that the vision of our conservation groups is a mere half century behind the rest of Europe, but that they misrepresent the state of nature in this country. They pretend that the current management system is more or less the best that could be envisaged. They glorify our shattered and depleted ecosystems. In reality, the best protection for clean water supplies, soil carbon, nature and tranquility is the reduction or cessation of farming in crucial places. For example, if you want to prevent floods and ensure a steady supply of water downstream, the best means of doing so are to get the sheep off (which compact the soil and prevent trees and scrub from returning), to stop the dredging of tributaries by farmers and to de-canalise the rivers. So why do conservation groups feel obliged to recycle such myths? Is the fear of the farming lobby so great that the groups supposed to protect the countryside must repeat National Farmers’ Union propaganda? This is not to suggest that the conflict between hill farming, wildlife and watersheds is easy to resolve; though I’ve put forward some proposals that I hope might help. Nor is it to propose that there should be no farming in the hills: I recognise the value of the culture and traditions associated with it, just as I recognise the value of the wildlife and water storage it displaces. But why can’t we have some honesty about these issues? Some recognition that different aspects of what we might want to see in the uplands – traditional grazing and wildlife restoration for example – might be in conflict? What harm would it do to acknowledge this? You get some idea of the extent to which the conservation groups have collaborated in both the destruction of the natural world and the cover-up of that destruction when you realise that not one of our national parks is rated higher than Category V in the International Union for Conservation of Nature’s directory of protected areas. Most of the world’s national parks are Category II: “large natural or near natural areas set aside to protect large-scale ecological processes”. Some are Category I: “strictly protected areas set aside to protect biodiversity”, or “wilderness”. Category V areas are not protected in any meaningful sense: they are, broadly speaking, ranchlands and similarly altered ecosystems. And that is all we have. That there should be designated areas in which farming traditions are recognised and respected is not something I have a problem with. That there should be nothing else is something that concerns me very much. What it means is that there is no significant area of land in the United Kingdom in which either humans or wildlife can escape intense human impacts. I believe such escapes are essential for developing a sense of ourselves and our place in the world, for allowing the mind to run free, for shedding the stress and confinement of our crowded lives. You want to get away from it all? Then you’ll have to go abroad. Does this stark fact not give our wildlife groups occasion to stop and think and wonder what they’re up to? Wouldn’t an ambitious, proactive conservation movement be challenging the fact that we have nothing better than Category V protected areas? What do these groups exist for after all? To reassure us that everything is just fine, even as the natural world is locked in a state of extreme depletion? We need to start a debate, a debate that asks a number of obvious questions. What are we doing and why? What is the basis of the decisions we have made? Is it sound? What do we want and how could we get it? These are the questions our conservation groups have failed to ask. Until they do so, they will continue their long and lonely trek into fatuity. At the moment their vision seems as empty and simplified as the moors they fetishise. It is time they started thinking like a forest. By George Monbiot, published on the Guardian’s website 17th October 2013. George Monbiot is a well-known investigation reporter and columnist for the British newspaper “The Guardian” as well as a member of the BBC Wildlife magazine’s advisory board. He is also the author of best selling books such as “The Age of Consent” (Flamingo : Harper Perennial, 2004) and “Captive State” (Pan Books, 2001) and recently “Heat, How to Stop the Planet Burning” (Peguin Books, 2006). In 1995, Nelson Mandela presented him with a United Nations Global Award for outstanding environmental achievement. He has been named one of the 500 most influential intellectuals worldwide by “Prospect” magazine.